A very happy new year to readers of Heaven. Man. Earth.!! At this time of the year, I have been busy conducting corporate talks for 2012 Feng Shui Forecast and also at the same time working with the media on interviews which cover topics like “Is it auspicious to have Dragon babies?” and 12 Animal Signs forecast for 2012. 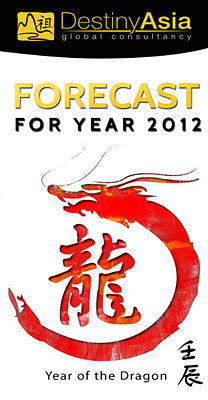 With this I would like to share with you a succint description of your chinese zodiac outlook for the dragon year. Just click to find out more!